The UK's electronic intelligence agency has taken the unusual step of issuing a statement to deny it will track all UK internet and online phone use. 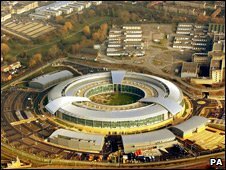 Government Communications Headquarters (GCHQ) said it was developing tracking technology but "only acts when it is necessary" and "does not spy at will". Jacqui Smith said instead firms should record all people's internet contacts. In the statement, GCHQ said one of its "greatest challenges is maintaining our capability in the face of the growth in internet-based communications. "We must reinvest continuously to keep up with the methods that are used by those who threaten the UK and its interests." But the agency added: "GCHQ is not developing technology to enable the monitoring of all internet use and phone calls in Britain, or to target everyone in the UK. "Similarly, GCHQ has no ambitions, expectations or plans for a database or databases to store centrally all communications data in Britain. "The new technology that GCHQ is developing is designed to work under the existing legal framework." The denial comes days after Ms Smith ditched plans for a giant centralised database to store all internet and phone conversations. Instead she announced that communications firms will be asked to record all contacts between people. The new system would track all e-mails, phone calls and internet use including visits to social network sites, but not their content. On Sunday, the Sunday Times newspaper reported that GCHQ was in fact forging ahead with plans to monitor all communications in Britain. According to the newspaper, £1bn is being spent on a "Mastering the Internet (MTI)" programme that would involve "thousands of 'black box' probes being covertly inserted across online infrastructure". Shami Chakrabarti, director of Liberty, said the GCHQ statement raised more questions than it offered answers. She added: "There are various comments about what this project is not intended for - but not what it is designed to achieve. "More importantly, when is Parliament going to have the opportunity to debate it?"